Go to sheet metal fabricator's throw out pile. Ask if you can have a small piece of scrap. They always say yes. 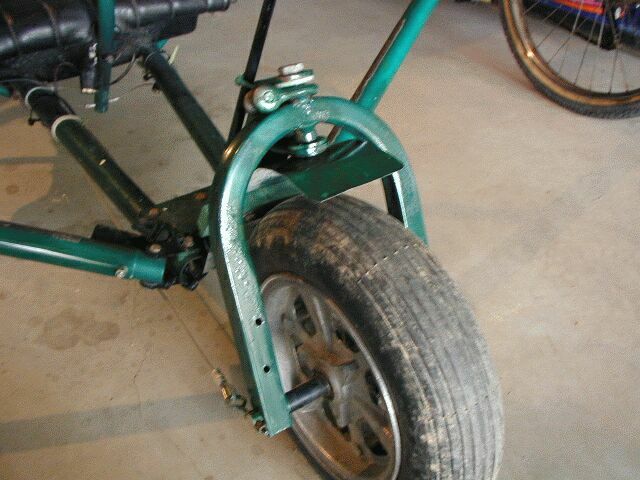 Pick up a piece about 4.5 inches wide and long enough to go from as far forward over your front tire as you want, and, curving down against the gooseneck, to stop a bit below its base. Fasten it at the top end only via the nut(s) that hold the front forks on. On an SR2 there is only one. 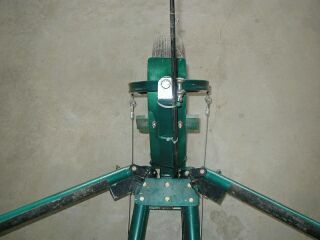 It will take a natural curve shape back against the fork support tubing. Slightly round the sharp corners with snips and dress them lightly with a file. The fender is almost done. Do not fasten the bottom end securely. It has to be able to slide up and back down a wee bit. You can get as fancy as you want here, from slots and bolts, or spacers and rivets or whatever your talents dictate. 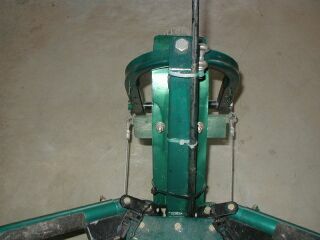 You can also be as simple as securing it loosely with a single heavy duty cable tie at the base of the gooseneck. (or two at right angles) Fender's done. It reduces the spray on your glasses. Now here's the cheapo brake. Cut a piece of 1"x1.5" wood like the kind they use for a garden stake, or something similar, (bigger as you like), and long enough that when correctly placed across (at right angles to) the inside of your fender, your feet can make contact with it on both or either side. Bolt this to your fender where a slight foot pressure will cause it put pressure on the tire. Sand it and paint everything and the brake is done. I have seen a variation on this that was a bit nicer. The wood to tire friction plate was a piece of plywood plate hinged to the gooseneck, and had a spring return. It was the fender. The owner had used some chrome swept back pedals of some kind, fastened to this piece of plywood to push the wood plate against the tire. This allowed for something that actually looked like brake pedals and they were formed and placed in such a way as to get past but be adjacent to any other stuff mounted in the front area. These probably aren't for the scoffers of simple but cheap alternatives, or those capable of buying or doing something more traditional, classy, or nicer looking. But don't knock it if you haven't tried it. If you are running with nothing for brakes and can't seem to bring yourself to buy or make something more complex, this is as simple and cheap as it gets and they work extremely well. For the few times they really would HAVE to be used, tire wear should not be an issue. And most importantly, they will stop you from hitting that jet, on the apron, rolling on that corner, speed coasting into that ocean, ditch, or fence, or putting out your feet and breaking your leg or ankle. I know my first shot with the paint isn't great, but the next one should even things out a bit better. Sheet metal doesn't hold onto that stuff all that great. The oblique angle shows my block in near the tire. The fishing rod up the gooseneck is my home made antenna. Don't laugh. It works excellent. And as for the brake? If I want to lock that tire down and bark rubber off on pavement till it pops, I bet I could do it. So I guess the brake'll work. :-) Never know, might need it sometime. conditioning. Nowadays, with our fancy two seater's, the pilot should just instruct the student to put his feet on the ground. method also costs the pilot nothing as long as he makes sure the student signs a waiver.